But picking a new World Bank head is a little like picking a new Pope. The process isn’t just about the individual candidates for the position, but about the overall direction of the faith. And so, the controversy over Kim’s nomination is not really about Kim himself. It’s a debate about a philosophical schism in the development community. The original idea of development really gained strength with the de-colonialization that followed World War II in Asia and later in Africa. Just as objects in nature go through a process of development to achieve their full potential—acorns become oaks, tadpoles become frogs, human embryos become people—the idea was that newly sovereign states would experience a historical process whereby India would become Britain, Korea would become Japan, and Cote d’Ivoire would become France. It was thought that this process, which is now known as national development, would involve the natural replication of the four-fold historical transformation of the developed nation-states: Economies would become more productive and hence support broad-based prosperity, polities would become more fully responsive to their citizens, administration would become more capable, and societies would become more equal as birth-based distinctions (such as class and caste) and divisive identities (of kith and clan) faded in favor of modern social relationships. Note that each of these was something that would happen not just to individuals but to a country. Indeed, an article of faith was that the development of the nation-state was the best and most effective route to promote the development of individuals. It was assumed that the best way for Kenyans (or Haitians or any other national group) to develop as individuals was for Kenya (or Haiti or any other country) to develop as an economy, polity, administration, and society. Of course, within the fold of the development faithful, there have been plenty of conflicting opinions about how to carry out this agenda. For instance, there have been debates about the sequencing of the four dimensions. Some have argued that economic growth needs to precede democratization, others that democratization is instrumental to economic growth and should come first. These debates have been heated and vociferous and often ideologically charged; but all have been within a shared understanding that the goal was national development. This philosophy has had some spectacular successes. South Korea has moved from a basket case in 1962 to a fully developed nation-state—prosperous and democratic—in record time. Chile, after some tumultuous and violent periods of authoritarian government, has now arrived as a developed nation-state. National development has also seen some abject failures in which none of the four transitions have happened: Somalia, where the post-independence national development project has ended in anarchy and violence, is probably the most obvious example. And, in many other countries around the world, one or more of the four dimensions of national development have been painfully slow—sometimes economic growth but without democracy or freedom (as in Myanmar), sometimes democracy without economic growth, sometimes economic growth and forms of democracy but without an effective state (as in Pakistan). But throughout this time there has been another side to the development world: one that is less interested in national development and more interested in humane development. (I say “humane” development to distinguish from “human development,” which is an integral component of national development.) These are the people, often supported by philanthropy, who step into the breach where national development has failed. These idealists and the organizations they run have helped to mitigate famines, pandemics, poverty, violence, and lawlessness in some of the poorest areas in the world. Nearly everyone understands that humane development, while terrific and noble and important work, is not the same as national development. Famine relief is a holding action not an agricultural strategy. Refugee camps during periods of violence are needed, but they do not constitute a housing strategy. Earthquake re-building is not an infrastructure strategy. This is not to denigrate those efforts, which draw on the dedication of some of the most heroic people on the planet. But these people recognize that their humane work is palliative and the need for it shrinks when national development happens. 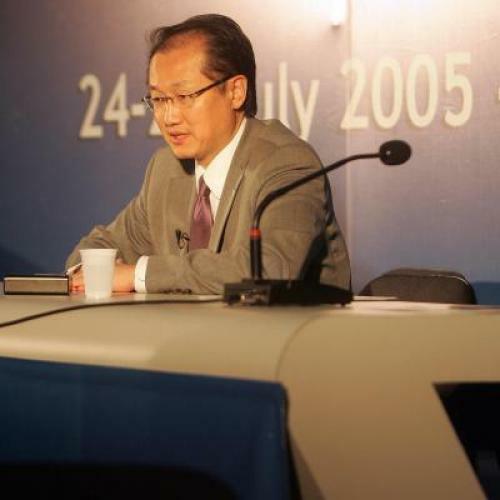 Which brings us back to the leadership of the World Bank. As a medical doctor who has devoted himself to mitigating the consequences of poverty in places like Haiti and Rwanda and the slums and highlands of Peru, Jim Young Kim is from the world of humane development. But the World Bank is fundamentally an organization devoted to national development, especially the economic component of that process. As a result, his appointment appears to be an intrusion by the world of humane development into one of the core institutions of national development. By contrast, the nominee backed by many African countries, Ngozi Okonjo-Iweala, has been finance minister of Nigeria and a managing director of the World Bank. In other words, she is from the world of national development, rather than the world of humane development. What has shocked the development world is that President Obama did not seem to know the difference. Lant Pritchett is Professor of the Practice of International Development at the Harvard Kennedy School.